Opening day of SF Beer Week really came together for us. Well, at least for me. Merideth called me earlier in the week asking whether a work trip up to Santa Rosa on Friday would work. Being the loving and supportive husband, I said we could make it work. She could drop me off in the City on her way to Santa Rosa. Later we could meet back up for SF Beer Week’s Opening Gala. 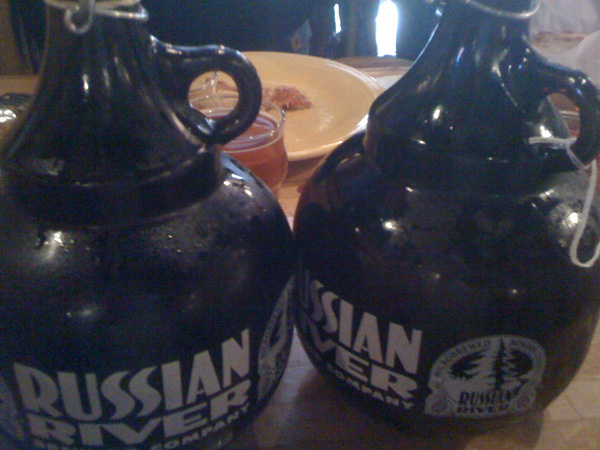 Then I remembered the Pliny the Younger release at Russian River Brewing was on Friday. We could go to Santa Rosa together; me to drink Pliny the Younger, Merideth to work. I was pretty psyched when Friday rolled around. In all our years of beer travel and visiting breweries, we have never been to a release party. 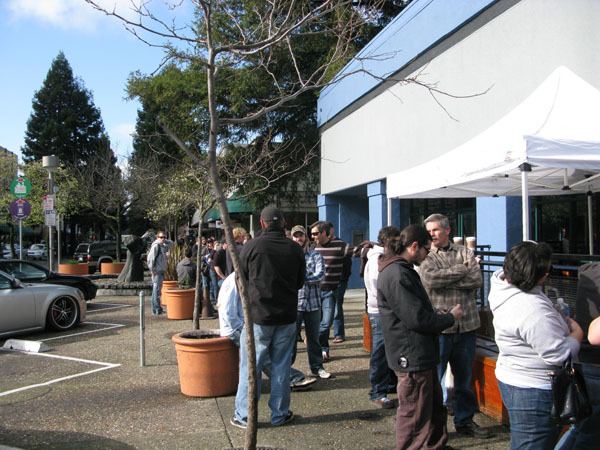 Now, I was going to the release of Pliny the Younger, Russian River’s renowned Triple IPA. Joined by our friend, Renee, who we picked up in the City, we were at Russian River Brewing by quarter past ten. We joined the end of the line of about a dozen people. A few minutes before 11am, Natalie opened the door and cheerily greeted the several hundred person crowd. 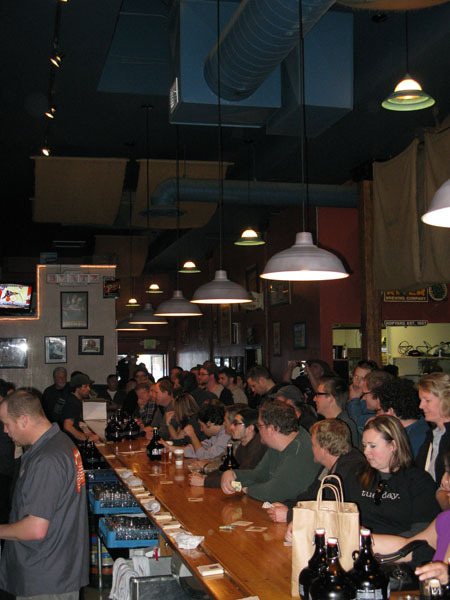 There was a festive atmosphere as the eager beer geeks calmly filed into the restaurant and filled available bar stools and tables. Growler after growler emerged from bags and backpacks. A bartender was already filling glasses with the hoppy goodness as Renee and I grabbed one of the high tables behind the bar. Two questions came to mind immediately. 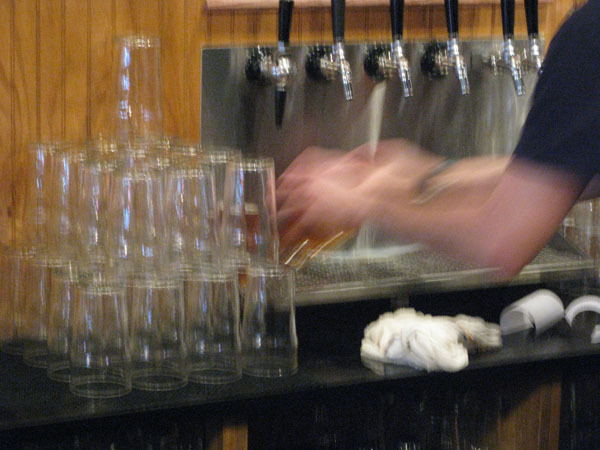 First, how fast can the staff pour Pliny the Younger and more important, how do we get some? Within seconds, our waiter came over and asked us what we wanted. Two glasses of Younger was our answer. I was worried that I was going to have to wade into the masses at the bar so table service was a very welcome development. Then we waited. Renee and I kinda looked at each other quizzically as others around us were enjoying their first glass. It really wasn’t a matter of impatience, we could see the staff working hard to get everyone a beer. Even Vinnie was running around behind the bar, filling glass after glass. We were just wondering if our waiter forgot us. After about 20 minutes, our beers arrived. After the first sip, I brilliantly proclaimed, “It’s the Elder with more alcohol…” The Younger does have that familiar Pliny hop explosion on the nose and palate, but it is soon followed by a mellow alcohol taste and a little burn as it goes down the throat. Quite smooth for 10.75% ABV. A wonderful beer, I still prefer the Elder. After the initial rush, the staff got into their rhythm. New beers were acquired easily as we settled in to have some lunch and wait for Merideth to finish work. Our waiter even took my two growlers to get into the 45 minute queue to be filled. The holiday-like feel continued into the afternoon as groups of friends gathered for a few beers. It really reminded me of a pub on Christmas Eve. Renee and I even made some new friends as our two empty seats made us popular with the standing. The most asked question of me by friends was “Where’s Merideth?” A completely valid question as we are rarely seen apart in beer circles. Midway through the second hour, she texted to say she was on her way. 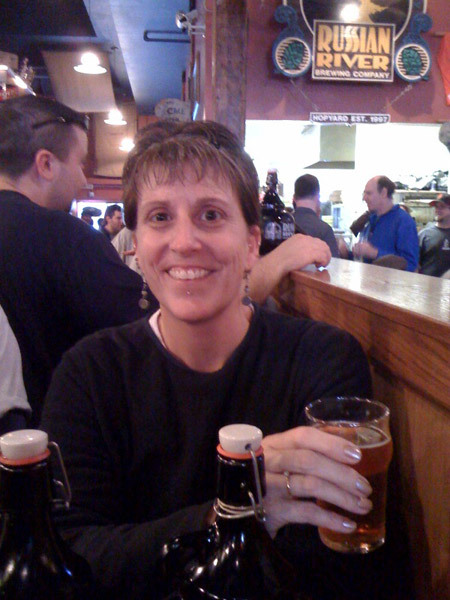 Fresh off work and ready for a beer she was luckily able to avoid the long line outside and join us. After saying Hi to our friends, she joined Renee and I at the table. Not a hophead, Merideth joined the merriment and ordered a glass of Younger. 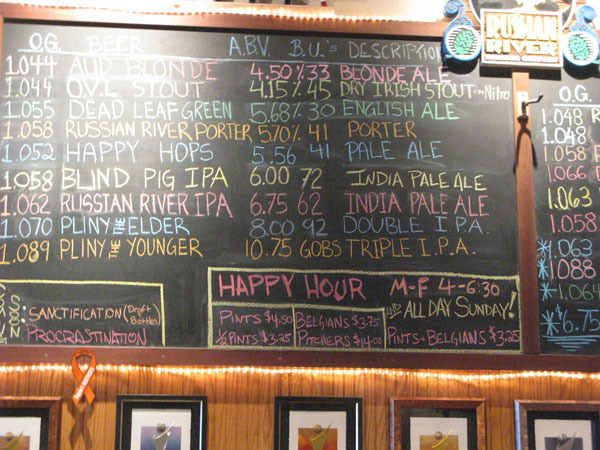 As it was time to get to the City, we wound up our time at Russian River. For my first release party, I had a great time. It is somewhat hard to fathom hundreds of beer geeks, Vinnie said 10 times more than last year, showing up for the release of a beer. Kudos to the Russian River staff for all their hard work that day. 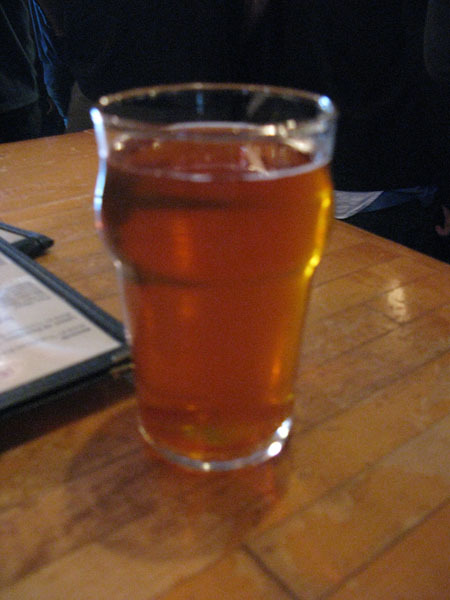 The last keg of Pliny the Younger blew later that evening.